We love pasta, and we like to try different meat combinations. We also like marinara and alfredo sauces, however sometimes simple is better and I have found that pesto allows me to get creative with the pasta combinations. It is also easy to make, you can make a big batch and freeze to use later. Here is a simple family recipe for homemade pesto. Combine basil leaves, olive oil, pine cuts and garlic on a blender. Blend until a paste forms. Add cheese and salt and continue blending until mixture is smooth. Put into a small bowl and then top with 1/2 inch olive oil and let cool. If you would like to freeze, place in small containers and place on the freezer. Back pain? No problem, enter below for a chance to win this awesome product that is a great way to fight back pain in a natural way. My Life is a Journey has teamed up with a great group of bloggers to bring you this giveaway. You can read Nanas Deals and More full review of product HERE. VacuPractor is a Class I FDA Registered Orthopedic medical Device for the treatment of Lower Back Pain. VacuPractor is a revolutionary new treatment device for lower back pain. With a very simple design, the VacuPractor utilizes an outward pull on the lower curvature of the back that uses a suction to alleviate pressure on the discs and gently pulls the spine into alignment. it is made from polyprolylene and constructed to be very durable. 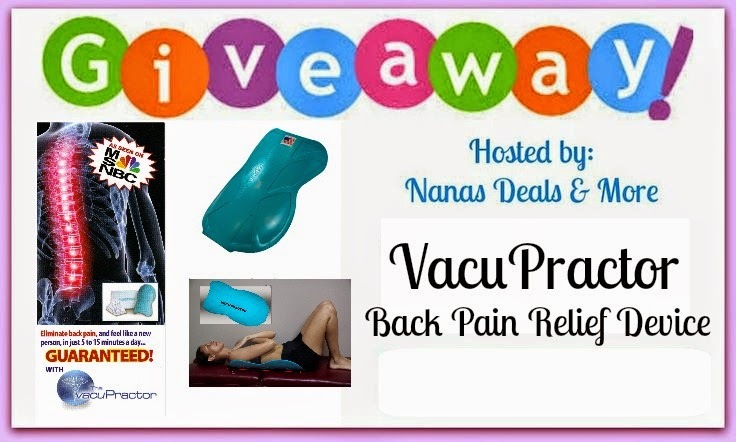 The VacuPractor is proven to relieve your lower back pain , you'll love it with the guaranteed results or your money back! Stretches the muscles, reducing or eliminating the need for muscle relaxing medications or expensive, painful surgery! (1) WINNER will receive (1) VacuPractor Giveaway Opens 8/27/14 to 9/9/14- Please come back when giveaway starts. Also we will be posting reminders during the promotion on this blog, our social media outlets and e-newsletter. Use Entry Form Below to Enter. Also by entering this giveaway you agree to all terms and conditions below and on entry form. Good Luck ! a Rafflecopter giveaway Terms and Conditions: Open US- 18+ . One random winner will receive (1) VacuPractor. One (1) winner will be selected at random. Only one entrant per mailing address per giveaway.. Winner is subject to eligibility verification. The winner will be notified in email, and have 48 hours to claim prize - if not claimed, prize will be forfeited. Unless entrant filled out mailing info on entry option. If so no verification is needed. If prize is not claimed, prize will be forfeited. This giveaway is no way associated with Facebook, Twitter, G+, Pinterest, or Instagram is in way associated and released from any and all liability. Sponsor ( VacuPractor) is responsible for mailing prize to winner, not Nanas Deals and More or any other Blog listed on this giveaway. By Entering this giveaway you also understand that this blog is not responsible for any technical issues that may arise or held liable in any way if sponsor does not ship or follow through with stated prize. We are only hosting this giveaway for the Sponsor only. Both the Sponsor and Nanas Deals has the right with out notice to end or cancel this promotion at any time with out notice for any reason. Anyone found trying to manipulate this giveaway entry will be disqualified with out notice . You can make this for dinner at home, but they are also great for a party. They are easy to make and a healthy option that both adults and kids will enjoy. Prepare the bruschetta topping: mix in a big bowl the diced tomatoes, garlic, sliced basil leaves, olive oil, vinegar, salt and pepper. Place the baguette bread (sliced) on a large baking sheet. Spread with garlic butter. Place the bruschetta mix, leaves of lettuce and chicken on top. Bake for about 5 minutes (to toast the bread). I have been very involved on my son’s education. Even though he goes to school, I complement his learning with activities at the house and even some extra homework. I believe school teaches basics, but parents are a very important component of kids learning and success in school. I am always looking for ways to motivate my son and for programs or websites that have activities I can use at home to help my son practice what he has learned and even teach him new things. Before school started we decided that it was time to refresh some of the things he learned in 3rd grade and also to start learning some 4th grade concepts. It was then when I found the website Prek12 Plaza . We are loving this website. I think it is great that we can use technology to help our kids learn. But we have to be careful because not everything that is out in the internet is correct and we do not want our kids to learn things that are not true. The PreK12 Plaza website counts with great resources and information we can trust. There is another advantage to the site, it is bilingual and multicultural. This is very important for me, because I want my son to have a great cultural background. Another cool thing about the website is the content called TAILs (Teaching as I Learn) where you upload videos of what your kids are learning, so they can help other families learn the same topic. There is also e-books and so many tools that will make learning fun. Kids can earn points that they can exchange for rewards. I encourage you to visit this cool bilingual website and see how it can help your child progress faster in school. It is fun and user friendly.